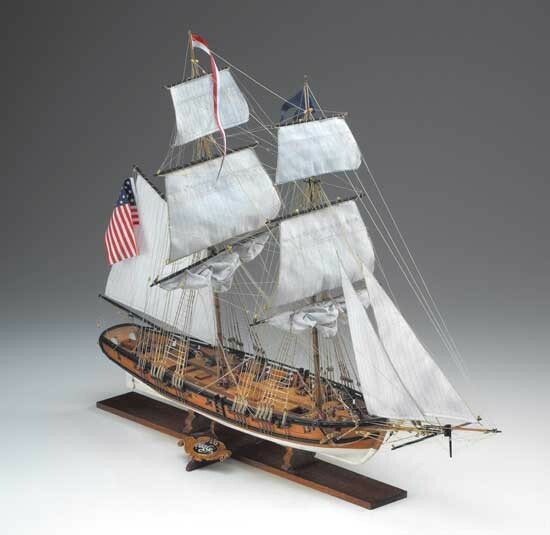 Corels wooden ship kit is a double plank-on-frame build and contains blocks, deadeyes, gratings, mast caps, deck pumps and other hardwood components. Metal components include nails, rudder hinges, chainplates, anchors and rudder hinges, plus 20 cannons and carronades, beautifully burnished. 42 page instruction book in 4 languages, and 9 sheets of plans. SM61 Scale 1:85 Length: 25.6" Height: 17.3"
On 23 July 1812 to the north of Champlain Lake, in Vergennes on Otter Creek, where an iron works was formally situated for the production of nails, tips and canon balls in addition to a saw-mill which was able to use the timber furnished by the abundant surrounding white oak and pine forests, more than 200 shipwrights, under the direction of Adam and Noah Brown, laid down the keel of a new 20-canon brig: the Eagle. The launch of this 117-foot long, 34-foot wide brig armed with twelve 32-pounder carronades and eight 18-pounder cannons, weighing a total of 508 tons, took place on 11 August 1814. The reduced draught of the Eagle enabled it to sail effor tlessly in the low waters of the lake and its crew, comprising solely men from the United States Army — soldiers, military band musicians and even prisoners — consisted of 150 officers and sailors. On 31 August the float of the Royal Navy, to which the Eagle belonged, sailed from the Canadian border towards Plattsburgh, New York, where the ships, after dropping anchor in the bay, got into formation so as to be able to face an attack from any direction. The battle with the English took place on 11 September 1814 and ended after around 3 hours with the defeat of the latter, which had a decisive effect on the decision of the British government in signing a peace treaty with the United States on Christmas Eve of that year.